Warrior Witch concludes the Malediction Trilogy and I … I … I just don’t know what to make of it. The series started off quite nicely with Stolen Songbird, but the follow-up, Hidden Huntress, lost the magic that made Songbird a success. (If you are on my blog, then you can do a quick search and peek at my reviews of those books.) Warrior Witch, unfortunately, follows more closely in the steps of its immediate predecessor, rather than the more successful first volume. Tristan and Cécile are still fighting to save both humans and trolls from the evil that has fallen over everything and they must also fight to stop everything that they themselves have set in motion. Though it should be clear and obvious, Tristan is still trying to prove that he is the rightful heir to rule Trollus, while Cécile is still trying to bring Trollus and the human world together. This is all a great and exciting premise but … yawn. We spend most of this book with characters wanting to get something done, but not actually doing anything about it. The strong and memorable (from the first volume) Cécile is mostly just kind of whiny and Tristan isn’t much better. Either be the hero, or back off. Stop yapping about it. I was really hoping to get back to something beautiful and lyrical as we had in the first book, but the second volume set the reader (and the author) up with a story that needed to proceed, but it wasn’t anything as wonderful as that ‘Beauty and the Beast’ story we initially had. I wish I could have liked this book, and I had some high expectations, but it followed the only path that had been set up for it, and sadly that just wasn’t a path worth taking. This series really didn’t work. Go read the first book and enjoy, and then stop there. Looking for a good book? 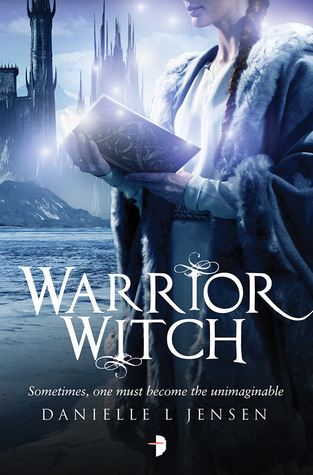 Warrior Witch brings about the conclusion of the Malediction Trilogy by Danielle L. Jensen but it’s only worth reading if you’ve already begun the series and can’t stand not reading the whole thing.